Now that the Christmas season is getting into full swing, it’s time for some decorating ideas. 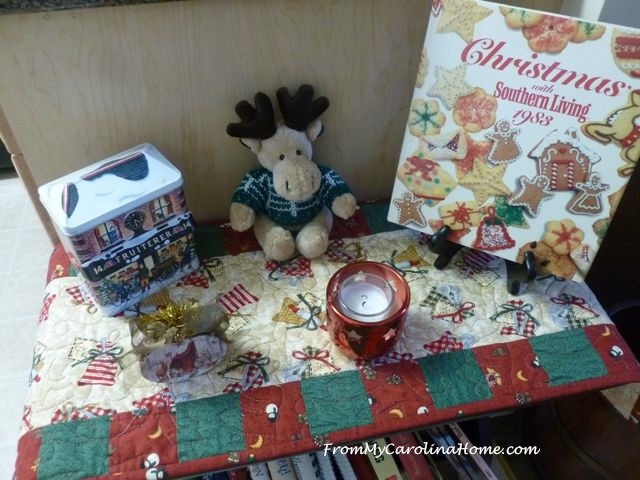 I’ll show you some of my decorating ideas from previous years, with a few new ideas thrown in for this season with links to patterns for quilted and crafted items. 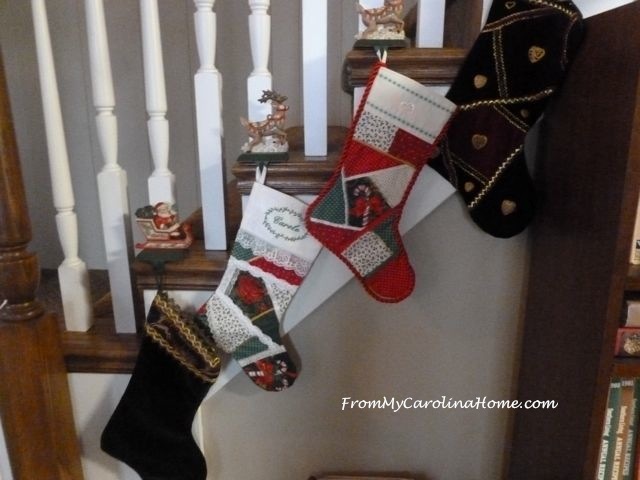 To begin, if you have some stairs, it is a fun place to hang your Christmas stockings using sill sitter type hangers. I don’t have a mantle, and some years have used the bookshelves for these, but I really like them on the stairs. Sometimes it is a nice change to use stocking hangers for special ornaments that might otherwise get lost on a heavily laden tree. This one is from our first Christmas together, quite some time ago. I tied a red ribbon on it and hung it from the top reindeer instead of the decorative stocking I used last year. Now I remember our first Christmas every time I go upstairs. Make a simple table runner for an end table. This is a free pattern, along with a couple more quickie projects, still available on my blog HERE. The focus fabric in the middle is a baking print with little cookie cutters and bags of spices tied with Christmas bows. 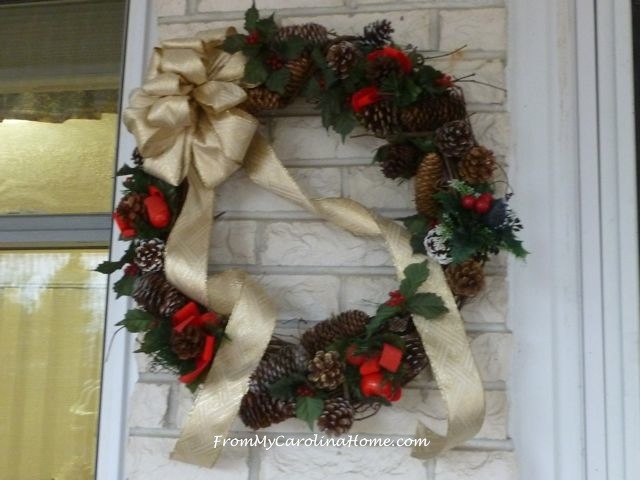 Add a festive Holiday Wreath to the front of the house. These are not that hard to make, and I’ll teach you how to do the bow too, HERE. See more wreath ideas with the Festival of Wreaths post from Monday. 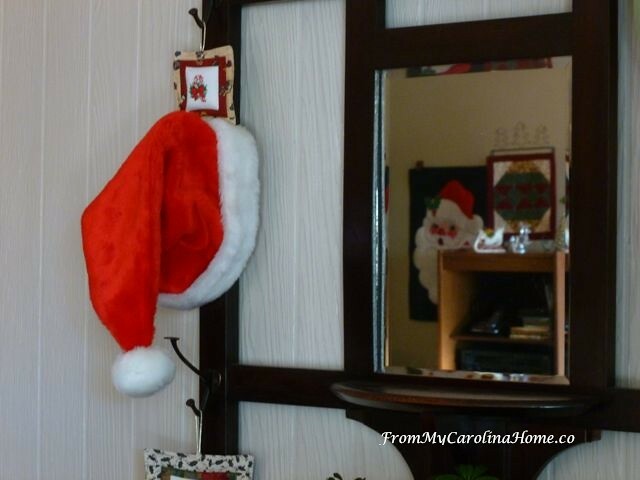 Hang a Santa hat on your hall tree or coat hook. 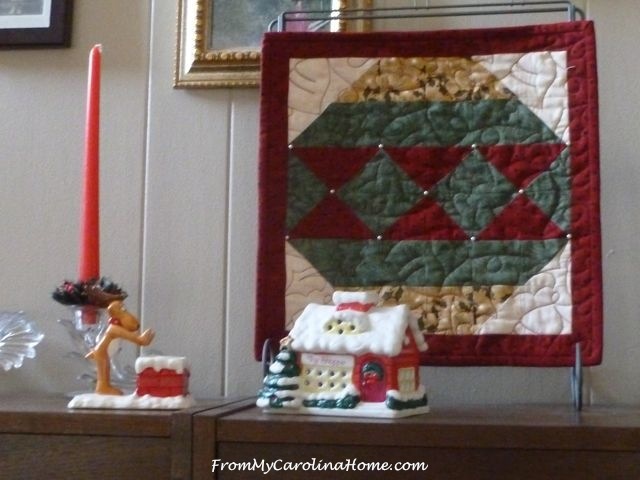 Make a Christmas Ornament mini quilt, and display with a few favorite Christmas pretties. I changed all the candles in my collection of depression glass candle holders to red ones, and added some candle ring greenery. This cute little reindeer warming his hooves over the chimney is a favorite holiday piece. Don’t forget the guest bathroom counter. 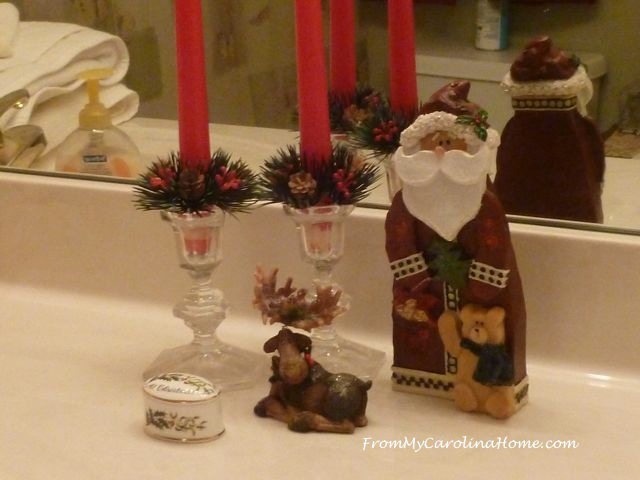 A simple Santa and playful reindeer with some red candles is festive for guests. 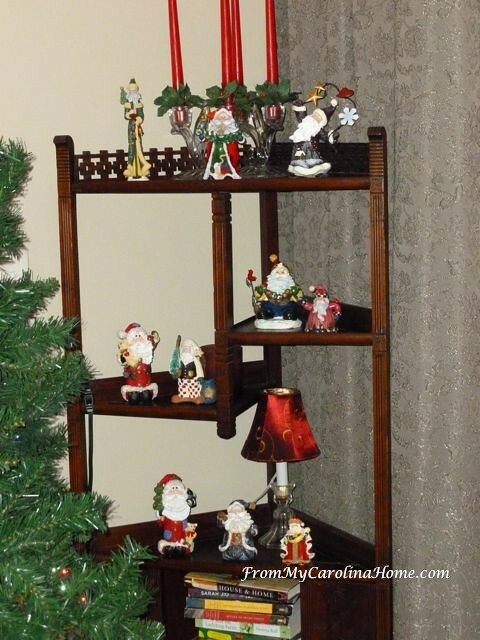 I collect small Santa figures, and gather many of them together in a display on an antique corner shelf. Not all I find make the cut though, only the ones I really think are whimsical without being too cutesy. This picture is overly bright because I just couldn’t get enough light into that corner so I had to use the flash. My two favorite Santa figures are on the top shelf, in the middle and on the right. 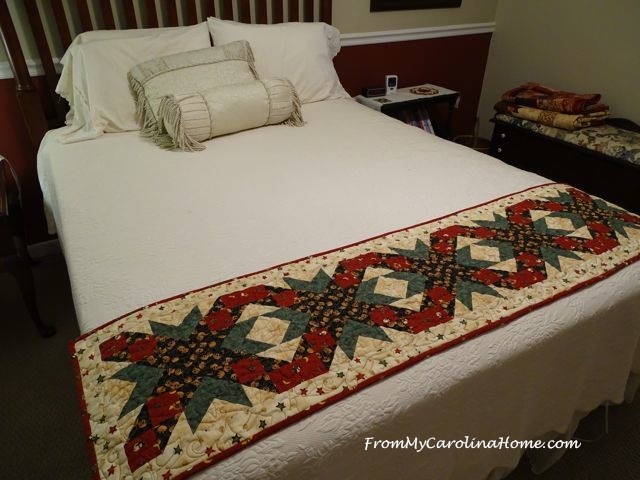 Pull out a Christmas quilt for the guest bed, and make one for your bed too. My Christmas Trip Around the World quilt goes so fast, that I made it from beginning the cutting to finishing the binding in just over a week – and that was around my work schedule and social commitments! While we are in the guest room, make sure yours it is truly ready with my Checklist for Guest Room Readiness. Using a table runner as a bed scarf is one way to add a holiday look without making or buying a whole quilt. Christmas themed throw size quilts go on the ottomans. This one is a simple sampler done in reds and greens. 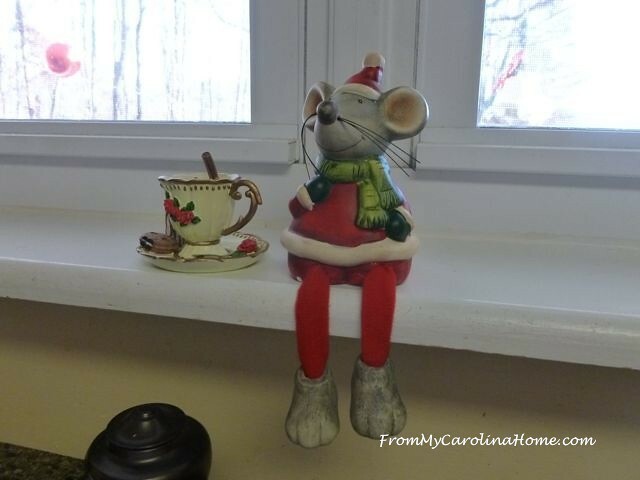 Another fun place to add a bit of holiday cheer is the kitchen window. I put this little mouse here with his teacup. I like his goofy feet that dangle. Set a pretty table in the dining room. 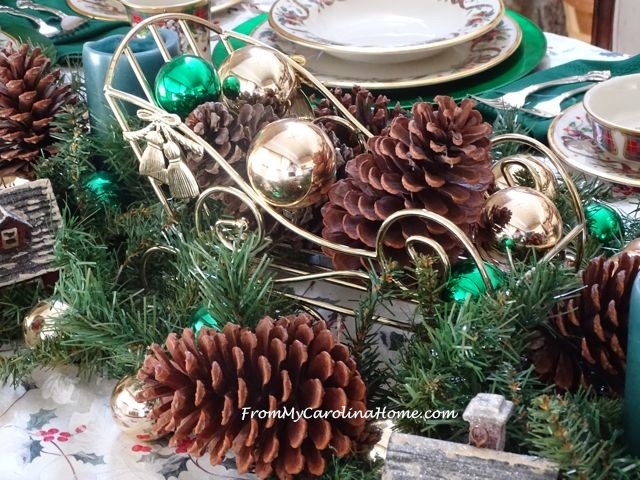 Next week I’ll show you a new Christmas tablescape, but for now here is last year’s rustic green and gold themed tablescape. 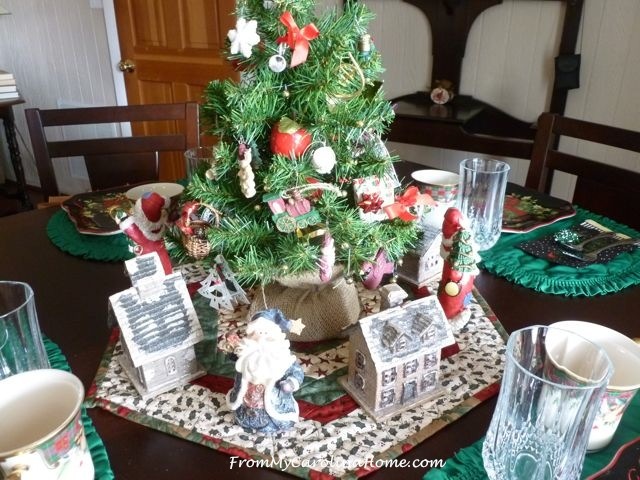 Put a small tree on your breakfast table. 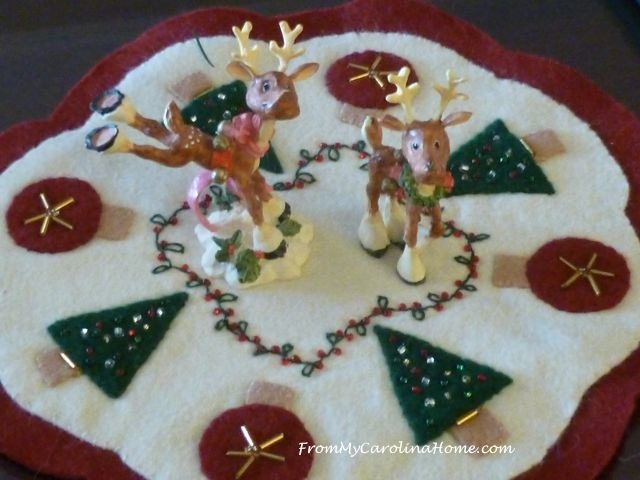 Make a Christmas Wool Applique Penny Rug for a cute pair of reindeer. 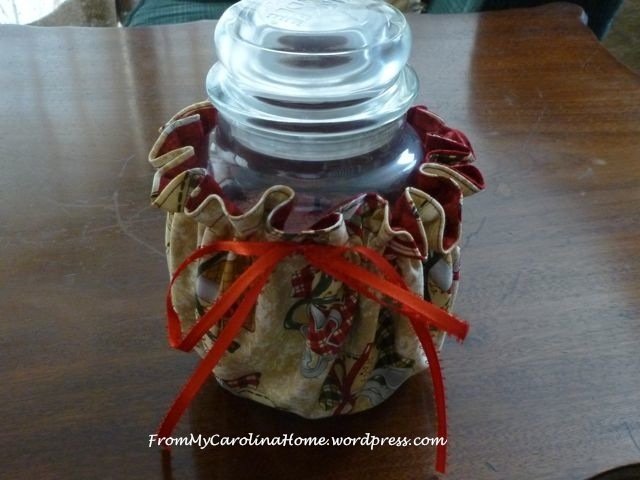 Sew a fun Candle Wrapper for a jar candle to sit on the counter. While you are unpacking your Christmas boxes, are there things that you haven’t used in a while? Seems like every year there are a few items that I unwrap and then decide not to use. This year, those items were put in a box, will be donated in time for someone else to enjoy this year, and reduce the amount of stuff I will store for next year. I pick up new things at the thrift stores during the year, so this helps keep the total in check. I have a goal of reducing one whole box full this week. Most of all, take time to breathe and enjoy each day. This is a fun time of year, but not if you are stressed out trying to make everything perfect. I personally think the best memories are made when things go a bit haywire, so embrace the days and just enjoy yourself! Laugh at the foibles, and make new memories with family and friends. 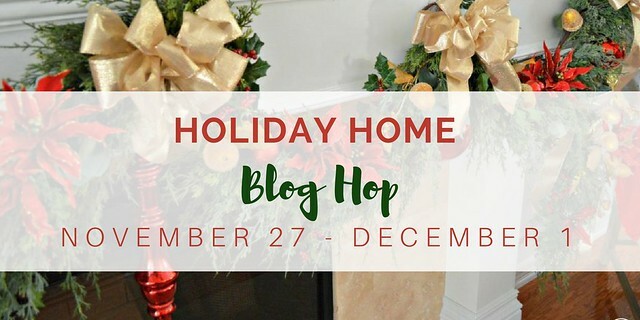 Now, for more Holiday Homes, Chloe at Celebrate and Decorate has put together a fun blog hop. Since I am on the last day, all these links are active now. Have fun! 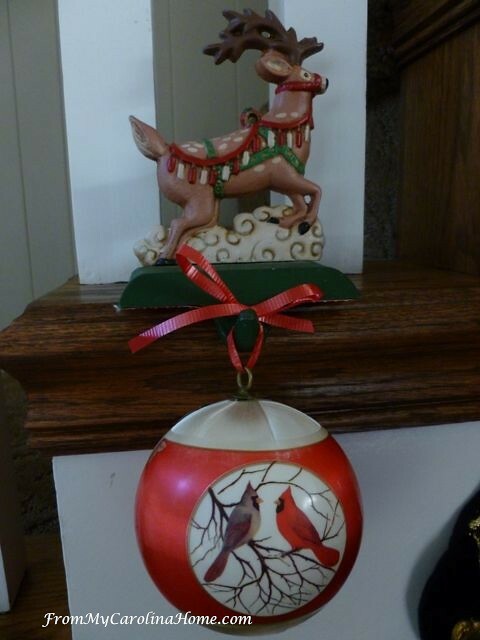 Do you have traditional decorations for this holiday time? Wow, thank you for your Christmas home tour!! I really enjoyed it. We have several nativity scenes we display, along with our Christmas tree. Carole, your quilts are beautiful. They add so much warmth and tradition to any Christmas setting. My step~mom was an avid quilter and I so miss her lovely creations. THanks for sharing on the blog hop. Thanks for sharing your Christmas decorations. I really enjoyed seeing them. We hang our stockings on the stairs too. There is usually some chocolate in ours and then we couldn’t use the fireplace so we moved them over. They look wonderful there. I like the idea of using the hangers for a special ornament too. Oh gosh, Carole, if I had no other decor for Christmas than beautiful textiles like yours, I would be in absolute heaven. There is nothing better than a beautiful textile that’s handmade with love. All of yours are just gorgeous. We use a table runner on our bed – love that idea, but table toppers, quilts, small samplers – I love them all. I have a few, and I cherish them and, of course, I rescue vintage quilts whenever possible for keeps or for resale. You do beautiful work, and I can’t believe you finished that Christmas Trip Around the World in two weeks! What a whiz! I love how you highlight special ornaments through little vignettes too, a nice touch. Thanks for the inspiration. Your quilting talents are exceptional. I love the idea of using a table runner at the foot of the bed as a Christmas decoration. I’m stealing your idea. Carole’s DH is very happy to read about her decorations: ” I have a goal of reducing one whole box full this week”. We have pieced stockings that my daughters started making in the 90’s for the entire family. This year Jessi made 8 custom for her cousin’s best friend who saw the ones from the past! I rec’d my mom’s old glass ornaments last year, and used them to make a framed wall hanging rather than risking them on a tree. Not valuable, just sentimental. Hopefully more decorating this year! the son and DIL finished their media space, so we have our dining room back. I found your pilgrim couple on eBay by the way, and one of the cats immediately knocked her off the piano and broke the lady’s arm and basket, but she glued back, and is now in MY space, not the common! Finished the new curtains and recovering the dining room chairs, I want to do a runner for the top of my piano (almost 6 foot tall, upright grand from 1906 that has seen a lot of loving abuse…). you are so inspiring! PS my new Juki arrived yesterday! have to wait until Sat to open her up, sigh… but hooray! Thank you for sharing your beautiful home all decked out for the holidays. It was so fun blog hoping with you! 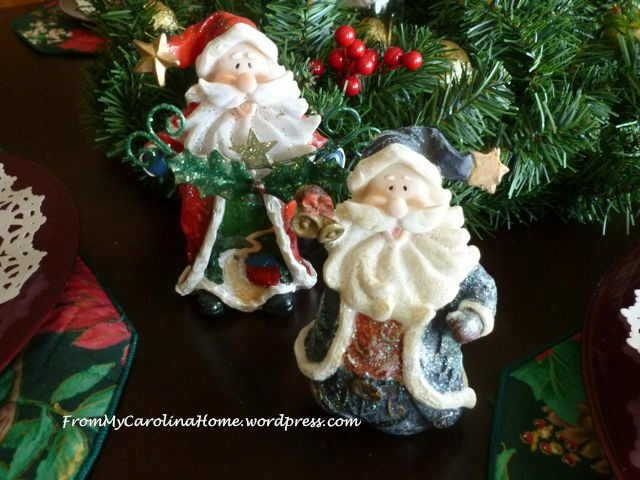 I have a collection of small Santas, too as well as larger fabric ones. I also have a snowman collection (much bigger than the Santas). Today I plan to get out the Santas and the table top trees. I no longer put up a tree. I want to find some way to display some of my favorite ornaments. But first my husband’s political memorabilia clutter has to be dealt with. I really enjoyed your Christmas decorations, and I will definitely use the bed runner idea as a way to dress up our bedroom. 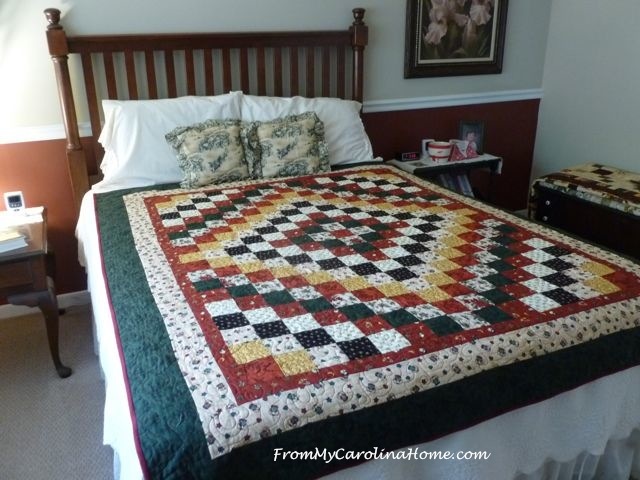 A Christmas quilt for the extra bedroom is a great idea…Girl #1 will enjoy that I think! We do have very traditional Christmas ornaments. I made cross stitch stockings for the girls when they were tiny, so they go on the mantel, and I have a few mini quilts and items that we spread around the house. Our tree is decorated with ornaments that have been collected and made over the years, so the tree is a very special memory marker in our house! Usually my holiday decorating is minimal. With your amazing ideas, I can’t wait to get started. Thank you for all you do for your readers and others all year long. You are truly an inspiration to us all in so many ways! 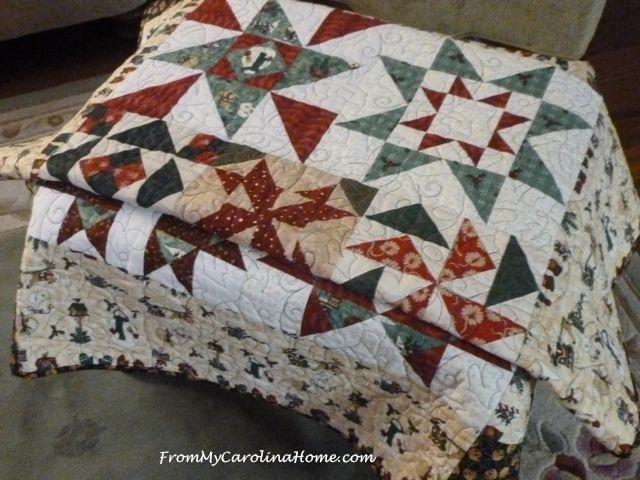 You have some beautiful Christmas quilted pieces all throughout your house that adds so much warmth for the holidays! I never thought to put a runner at the bottom of a bed but it brings just enough color to the bedding to say its Christmas in here. As a fellow Santa collector, I appreciate your Santas as well! Thanks for sharing your home on the hop. are such A Talented person. I get such enjoyment from your posts & pictures. Your home looks beautiful adorned for the holidays! You have such a gorgeous collection of quilts. It has been so much fun blog hopping with you! I hope that you have a wonderful and blessed holiday season!!! I think I am ready to start decorating today, you put me in the mood with all your festive ideas! So many fabulous quilted things! I love how you’ve incorporated them into your Christmas decor. The stockings on the stairs looks wonderful and is a great idea. Terrific advice on taking the time to breathe and enjoy each day of the holidays – for sure, Christmas is no fun if we are totally stressed out. Hope you enjoy yours to the max! Loved my stop here on the Blog Hop. How delightful!!! I’ve been traveling, but have put up two trees and sweet husband had the outside lights blazing for my return. Your home looks warm and welcoming and that is my hope that all who enter our home will feel the peace and love of this blessed season. Thank you for the tour, patterns and inspiration. What pretty little accents you have added to celebrate the holidays throughout your home! Your sewing skills really shine in your runner and little quilts! Thank you for joining us again for another blog hop! Your beautiful quilts make everything cozy and so perfect for the holiday season! Lovely craft and decorating round up Carole! Carole, your quilts are fabulous! I so enjoyed seeing your creative talents on display! I have to say I also have the 1983 Southern Living!